This bottle of 2011 Girard Petit Verdot was sourced at the tasting room in Yountville, ca. We have had this bottle of 2011 Petit Verdot for a while and I believe it came in a wine club shipment. 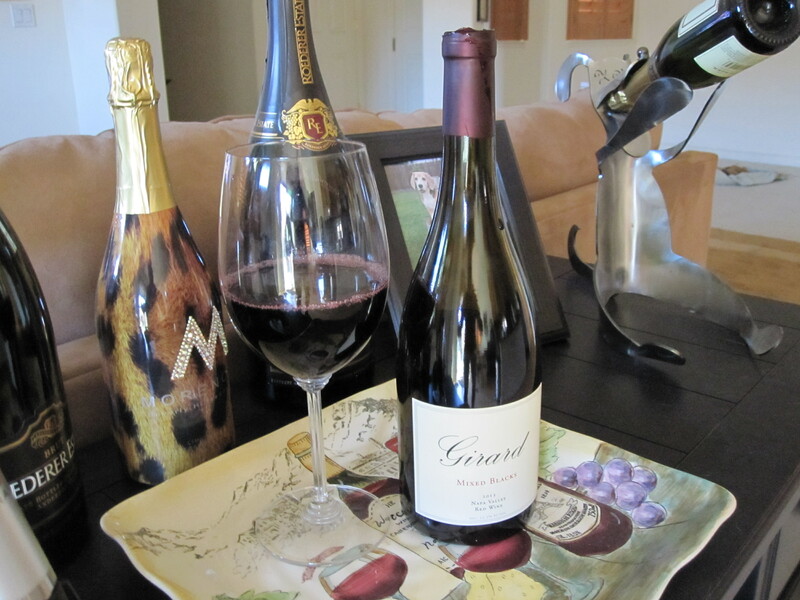 If you have spent any time on my wine blog, you know that I am a fan of Girard wines. They have great wine, at a good price (for Napa). To the wine: There was a first with this bottle of wine from Girard. This Petit Verdot needed some time to air out. Since the bottle has been in the wine jail for a couple of years, I can rule out bottle shock or wine stored wrong. I took my first sip and the wine felt a little angry. After letting the bottle breath for 30 minutes, it changed its character. Nose: The nose of the Petit Verdot had a very strong nose. Very little effort with the swirl, gets you a very unique nose. I want to attempt to explain the nose, as a chemical smell. This is not bad, it was just not what I expected. Tasting Phase: During the tasting phase, I received a combination of spice and strawberry notes. The tasting phase was strong and added character to this unique bottle of wine. The Finish: The finish on this Girard Petit Verdot was full of spice notes. The finish on this wine was medium warm, and had a hint of strawberry. Conclusion: Ok, this bottle of wine is pretty unique and not the norm from Girard Winery. That being said, the three phases of tasting this wine brought the nose of the wine into perspective. I would buy this wine again and look forward to my next trip to Girard. Girard Winery produces some pretty good wines. They have a full range of wine varietals at a very reasonable cost (for Napa). Sandra and I stop into the tasting room, when we are in Yountville. The tasting room is not very large, but the staff make it work for you. I have been stopped in the parking lot letting me know they have something unique to taste, buy one of their wine servers. They are on the main drag in Yountville, but be aware, it is a little hard to see it from the road. The first time we visited the tasting room, we had to call them three times. It was worth the effort, as we are wine club members. Their price point and quality make it possible to pick up a mixed case, for a few hundred dollars. To the wine: The term “Mixed Blacks” is meant for the wine that is sourced from a 100 year old vines of unknown varietals. It is believed that there is even some white wine grapes in it. Girard simply do not know what is in the field, but they have made wine out of it. Nose: The nose on this mixed red wine was strong on the nose, that had no spice notes, but a hint of strawberry. I will add that there was a hint of berry notes. The nose was unique and pleasant. Tasting phase: During the tasting phase was full of strawberry, plum and jam notes. This was very unique and there was a certain quality to it. Finish: The finish on this mixed red wine was pleasant and warm. There were spice, strawberry, and jammy notes. Again, this is a unique wine experience. In the end, Sandra and I have sourced another bottle of this wine from the tasting room in Yountville, California. It is just a unique bottle of wine that is distinct. I will call it a statement wine, for those willing to take a risk. If you have read my posts on Alpha Omega, you will know that both Sandra and I are huge fans of the winery and the wine they produce. The Cabernet Franc is a great example of their level of wine making. Sandra is a big fan of Cabernet Franc’s and when Alpha Omega came out with theirs, we were there to sample it (and buy it). I will admit here that I am biased, but this is a very good bottle of wine. I will keep this short. Nose: The nose on this Cabernet Franc was light and had some spice and strawberry notes. The nose was enjoyable. Tasting phase: The tasting phase had some spice notes, with a slight berry notes. I will go as far as to say there was some tangy notes, to the tasting phase. Finish: The finish had spice and strawberry notes. I found the wine pulls from the back of the tongue. 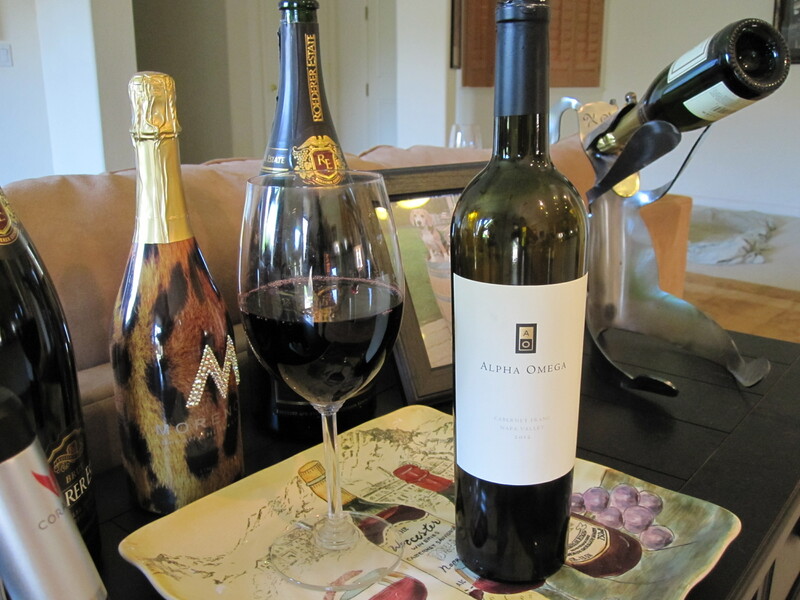 The finish had a quality to it that I have come to expect from Alpha Omega wines. I can solve the riddle of if we have purchased more of this wine and we have. We are headed to the winery this weekend for a private tasting, with the Director of Sales. He wants some input on the experience at the winery, for its customers. By the way, the view from the tasting area is great in the winter months. Mountains, fog, clouds, and cool weather equal a great tasting experience. 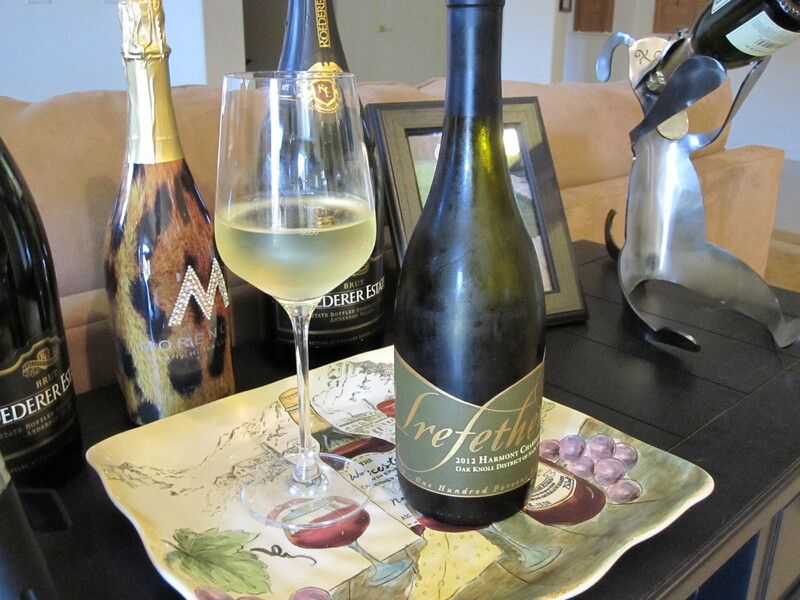 This bottle of Trefethen 2012 Harmony Chardonnay was sourced at the winery, just before the big earth quake that devastated many Napa wineries. We were very surprised when we arrived and found two of our favorite wine servers. Adam from Alpha Omega and Angie from Charles Krug. They both left their mother ships and moved to Trefethen. It was great to see them. We were given a great tour through the gravity fed winery and they introduced us to their whole product line. The winery looked great. During the earth quake, the gravity fed winery was damaged. It is a shame, it was a really good looking and historic building. To the wine: This bottle of 2012 Harmony Chardonnay is from the Oak Knoll district of Napa valley. The grapes in this Chardonnay were sourced on the estate of Trefethen. Nose: The nose on this Chardonnay had very nice floral and fruit notes. The nose was medium in intensity and pleasant. Tasting phase: The tasting phase was pleasant and full of floral and green melon notes. The tasting phase was distinctive and of quality. Finish: The finish was very mellow and falls away. There was no warmth and pulls lightly from the middle of the tongue. The finish had some nice fruit notes that lingered. Conclusion: The name on the bottle of Chardonnay is Harmony. This makes sense because this describes this wine very well. Everything had a balance to it and I have purchased another bottle of this wine. 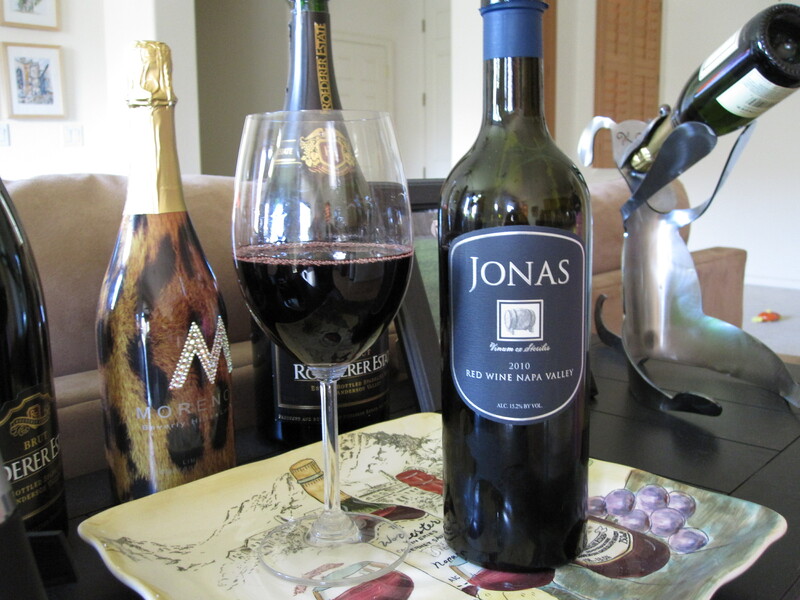 This bottle of Jonas Red Wine 2010 from Napa was sourced in the Girard Winery tasting room in Yountville, ca. This bottle is normally not available for tasting. I have a philosophy that if I am served the wine, I just might buy it. When I discussed this philosophy with the server, the server opened up a bottle of Jonas. In the end, we purchased a bottle of it. There was a saying on the label of this bottle of wine and it states “Vinum ex Steriliis.” This is Latin for “Wine of the Barrel.” The wine is a blend Cabernet Franc and Syrah. The production volume of Jonas is 150 cases, so you can see why it is not normally tasted, at the tasting room. Nose: The nose on this Jonas Red Wine was strong and full of berry notes. Nothing individual dominated the nose of this wine, it was just nice and added to the wine tasting experience. Tasting Phase: The tasting phase on this red wine, was strong on the berry and spice notes. Nothing overpowering was sensed during the tasting phase, but this is a bolder wine, that can stand on its own. Finish: The finish on this wine pulls from the full tongue. The spice note was muted on the finish and lost a bit to the berry notes. I really enjoyed the finish on this wine. Now to the question: Yes I would purchase this wine again. I look forward to next years vintage. 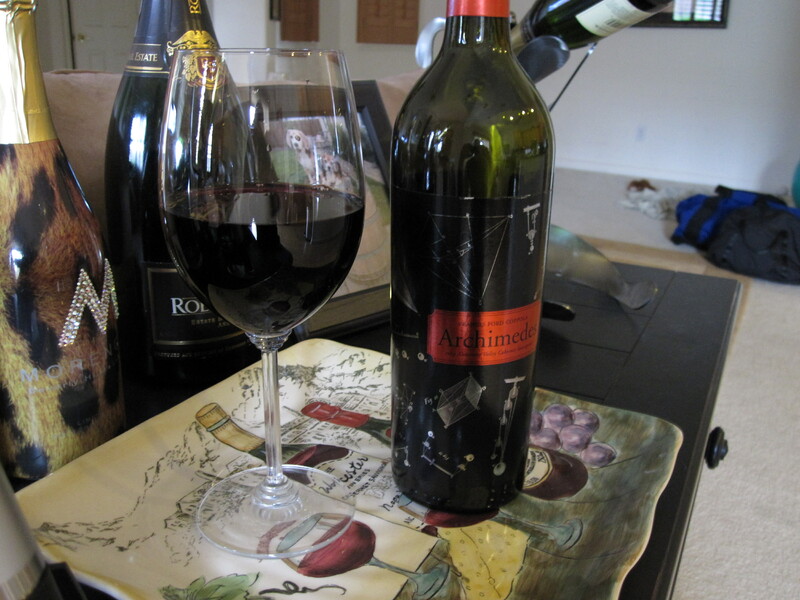 This bottle of Jeff Runquist 2012 Cabernet Franc, was sourced at a tasting room in Amador County. This tasting trip was part an invite from a vendor, who is a friend of mine. Friend first, vendor second. I have never heard of Jeff Runquist, but I can tell you he is a talented guy. I do not have very detailed notes on this wine, because the bottle was opened and drank rather quickly. Sandra and I enjoyed it. Nose: The nose on this Cabernet Franc was full of berry and spice notes. I would say the nose was medium in intensity. Tasting Phase: During the tasting phase, the wine gives you a medium heat with a strong spice note. I found this to be very enjoyable and balanced. Finish: The finish was warm and full of spice notes. I found the finish fades quickly and is a little light. I found the finish to be of quality and the wine is distinct. Sandra and I sourced this bottle of Francis Ford Coppola Archimedes 2009 at the winery. The winery is a showcase of the directors movie props, that you would expect. It is worth going to the winery to see the movie props. The winery was a little crowded, but we had a motivated wine server. The Archimedes is a Alexander Valley Cabernet Sauvigon, of the year of 2009. Sandra and I bought this bottle after the wine server slipped us a sip. 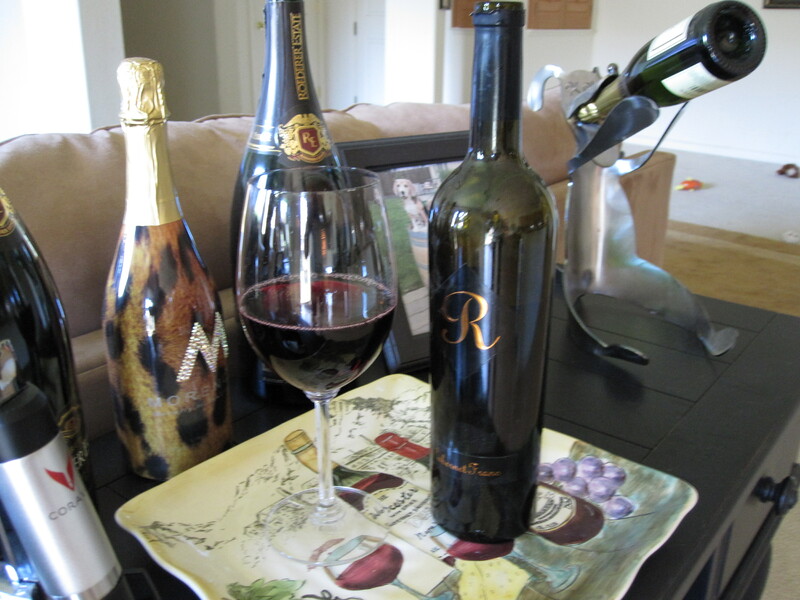 This was the wineries pricey bottle and around $70, its a deal, compared to Napa wines. Nose: The nose on this Cabernet Sauvigon was light and full of plum and cherry notes. I was a little surprised at how light the nose was. It still worked out. Tasting Phase: During the tasting phase, I was not super impressed. I am a tough sell. Don’t get me wrong, it is a good wine. I got plum, cherry and very light tannis. The tasting phase was not warm and it was very light. This tasting phase had a quality t it. Finish: The finish to this wine was very light with a small amount of warmth. The wine pulls from the middle of the tongue and was not expected. Ok, this wine was not bad, it just was not spectacular. I am not being fair here. Yes we bought the wine at the winery and had a good time. I just have not been a big fan of the Hollywood wine makers. Yes we bought several bottles of wine and this wine was pretty good. Would I buy it again, probably not. The Coppala winery is surrounded by other wineries making pretty good wine. Spreading the wealth.